Childhood. Possibly the only time in your life that you're truly free. It's a time to explore, a time to encourage imagination and a time to connect with the world around you. Here at Witter Towbars, we're great advocates of muddy experiments, nature trails and pretty much anything to do with the great outdoors. Fresh air and adventure can have such a positive impact on children's well being, which is why it's important that we continue to encourage the next generation of mini adventurers. Riding your bike so fast down a hill that you're not even sure you can stop. Dirtying your clothes by making mud pies and climbing trees. The excitement of your very first camping trip. These are the type of childhood memories that most of us have relating to the great outdoors. Sadly, the next generation might not have so many of them. How adventurous are your children? We listed 22 popular outdoor activities that children might experience between the ages of 4-16. Ranging from bird watching to swimming in open water, we then asked parents to name the activities that their children have not done. There are certain activities that we presume most children have enjoyed, like riding a bike for example. Many of us will have memories of Mum and Dad trying to help us balance on two wheels. The one where they hold on to the back of your bike seat and promise not to let go. Interestingly though, 32% of parents stated that their child had never learned to ride a bike. Shocking. Do you want to hear more of our shocking 'I have never' statistics? 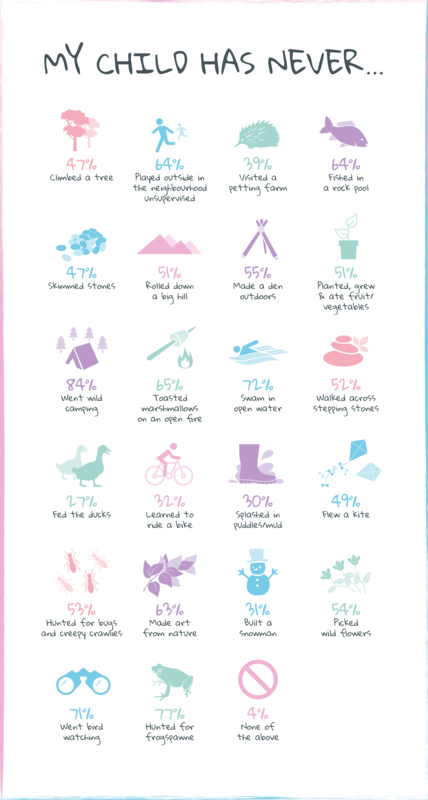 One of the most worrying findings from our survey, was the lack of connection and/or interest that children have in nature and wildlife. With global warming increasingly threatening and challenging our current way of life, it's more important than ever that the next generation understands and appreciates the environment. Why are children missing out on outdoor experiences? Well 18% of parents felt that there is nothing really stopping their child from escaping the shackles of their bedroom. This could suggest two things: A. They're the parent of a curious child who already spends a large majority of time in the fresh air. Or, B. They're the parent of a hermit child who, for no particular reason, doesn't like going outside too much. For those parents that did feel that there's something getting in the way of their child rolling in mud and jumping in puddles, there were three reasons that were the most cited. The biggest barrier between children and the wilderness is the TV remote. Or the Xbox console, or perhaps the IPad screen. Maybe even mobile phones. Basically, 42% of parents said that screen time is the killer. Some parents commented that their child opted to socialise with friends through online gaming, rather than meeting them in person. 34% of parents said that supervision is an issue when it comes to outdoor play. Many parents made reference to the fact that it was their own fears that stopped their child playing outdoors. One parent stated, 'I worry more of their safety compared to my own childhood.' Parents also commented that busy roads and reckless drivers were a source of concern. The third most cited reason by parents is that their child has limited free time. It's hard to pinpoint exactly what takes up a child's time. However, additional comments made by parents point to indoor sports clubs and homework. 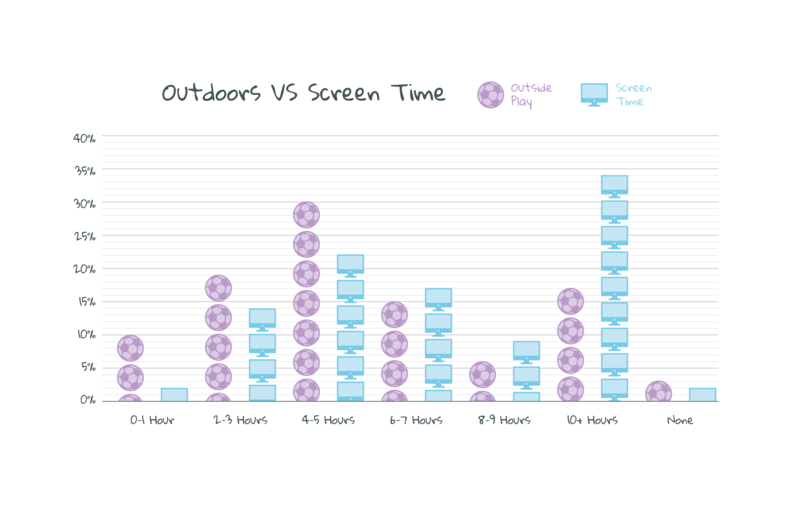 Screen time is the biggest barrier between children and the great outdoors, so we wanted to explore the extent of the issue. We asked parents to estimate how long their child spends staring at a screen each week and how long they spend outside. Fresh air time averaged at 5 hours and 16 minutes for the week. So, around 45 minutes each day. It doesn't sound too bad when you put it like that. 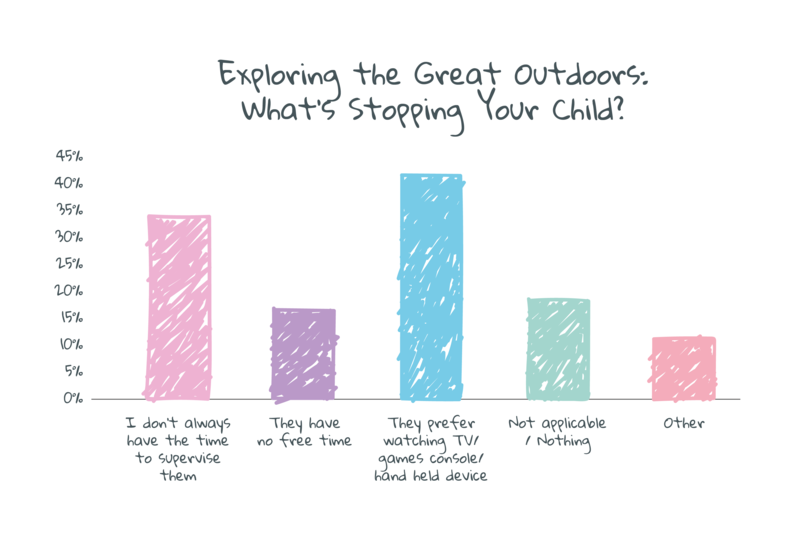 However, it's worth noting that the majority of parents revealed that their child spent 2-5 hours outdoors each week. Is that really enough to blow away the cobwebs? 6 hours and 46 minutes emerged as the average weekly screen time; 58 minutes a day. Better than expected? While the average sounds ok, attention should be given to the fact that 34% of parents stated that their child spends ten hours or more in front of a screen every week. Let's work that out. So if we go for the minimum of ten hours and divide that over seven days, that equates to 1 hour and 25 minutes every day…if not more! Great adventures don't begin on the sofa. Is lack of outdoor exploration really a problem? Or are we just suffering from 'kids nowadays' syndrome? 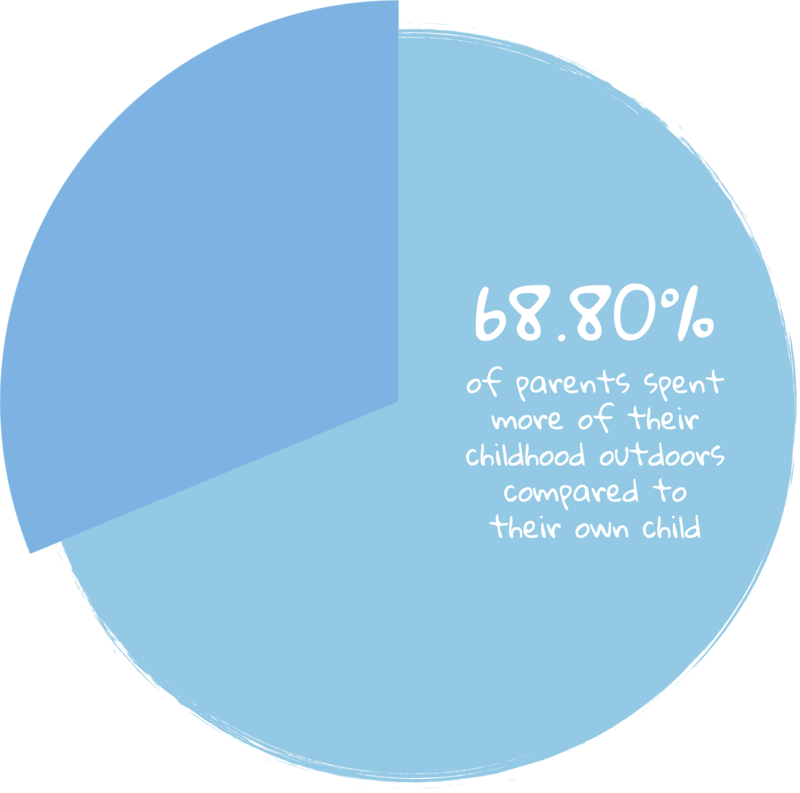 69% of parents believe that they spent more time outdoors during childhood compared to their own child. It's no secret that children aren't as active as they should be. In a recent report by the NHS it was stated that just 23% of boys met the guidelines for recommended physical activity each week, and just 20% of girls. The most documented and obvious consequence of children not engaging in outdoor play is the rise of childhood obesity. As a nation, obesity rates have risen by 24% since the 'slimming sixties,' bringing with it a host of secondary health implications. So, are we doomed to a generation of sedentary screen zombies? No. With nearly 73% of parents willing their child to spend more time outdoors, there's definitely hope! Whether it be through encouragement, creativity or simply by making time, the habits that this generation of children have adopted can always be altered. Are children really less adventurous? How many of our listed activities has your child experienced? We would love to hear your thoughts so why not tweet us @witter_towbars! This data has been collected by carrying out a survey of 2000 parents across the UK. If you are interested in seeing the full data set, please email lauren.simmons@reckless.agency to request further information. Transport your mobility scooter everywhere with Tri-Lift!